Fast acting. For back pain, leg & foot pain, muscle & joint pain. 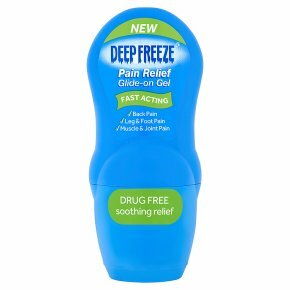 Drug free soothing relief.Deep Freeze Pain Relief Glide-on Gel works rapidly to provide cooling, soothing pain relief. The fast acting, cooling sensation will last for up to an hour, whilst the penetrating cooling provides longer lasting pain relief. Can be used with oral painkillers. Can also be used during pregnancy for muscular back pain. Instructions for use: Use as required. Replace lid after use. Warnings:<br>For external use only. Do not use: if you are allergic to any of the ingredients, on broken skin, on or near the eyes or other sensitive areas, with occlusive dressings or at the same time as other topical preparations. Stop using if skin irritation, allergic reaction, rash or other unwanted effects occur. Keep out of sight and reach of children. Seek advice: before using on young children, if you are diabetic or have a circulatory disorder, if symptoms worsen or persist for more than 7 days.<br>Discuss new pregnancy symptoms with a midwife.